Spring is definitely coming to NE Ohio! No pictures of all the mud. It's been raining for a couple of days, which is melting the last of the snowbanks. At least I can walk my dog because there is no ice or deep snow on the sidewalks. Work life has been busy. I made a pile of veils this week for my wedding veil customer. The alterations business is picking up. I need to finish an Irish dancing dress tomorrow. It's not a fancy dress and the customer is very large. She's an adult, getting back to what she loved as a girl. Red sweater for TKGA is progressing. I hope to finish the back today. I will need more yarn, but want to do the back and one sleeve before ordering. While I wait, I can work on the front and the patterns. Yes, that's plural. They want a machine knit sweater too. 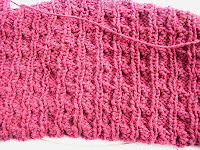 I'll work out gauge with Caron Simply Soft, which works on the machine, and use that to demonstrate techniques. It may show up in the hand knit pattern, since it's off white and a better color than cranberry for showing details. I'm showing the back of the fabric here, and its quite a bit darker. I didn't order enough yarn to account for the cables, and I've changed the design a little and that will use more yarn too. I saw something on line that was very interesting. 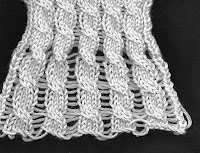 The white swatch was the machine knit original idea. I still want to use the drop stitch cable somewhere, sometime. 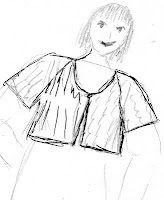 I also sent in a really bad sketch for a child's sweater. TKGA wanted an adult pullover. The front neckline will change in the final sweater. I may do something with the idea for a young granddaughter. The blue socks are mid leg. The lace pattern is easy, and the foot even easier. I don't need to finish them until April 30, but they'll be done long before. 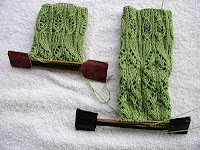 The green Mystery Sock progresses. I don't think I will have the second cuff ready by the time I catch up with Clue #3 on Monday. 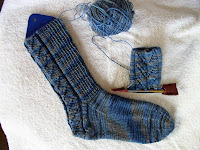 I'm trying to finish these by month end to qualify for Ravelry's Solid Socks group. Red sweater needs to be done by then too.